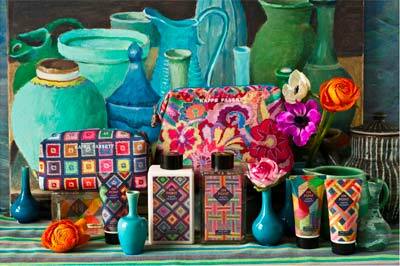 The first beauty collection, Achillea reinterpreted Kaffe Fassett’s exuberant use of colour and his hi‐octane floral designs found in his patchwork quilts and fabrics. In a natural move, On Point expresses the quiet, contemplative side to Kaffe Fassett’s world. It celebrates the colour and beauty of his geometric designs, explored through the medium of needlepoint. On Point sets a new meditative mood with its own unique vibrancy.